Pineapple juice is tasty and nutritious. You can drink it on its own, mix it with other beverages and in cocktails, or make marinades and sauces with it. 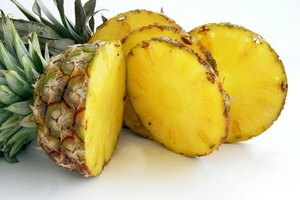 How you juice a pineapple will depend on the quality of your juicer and the condition of the pineapple. The trick is cutting the pineapple down to size to fit in the juicer. Choose a pineapple that has an intact rind, feels heavy and has skin that dimples slightly when pressed. Wash the pineapple under cool, running water. Do not use dish soap on it. If you wish to use soap, special soaps that are safe for fruits and vegetables are available. Pat dry with a clean cloth or a paper towel. 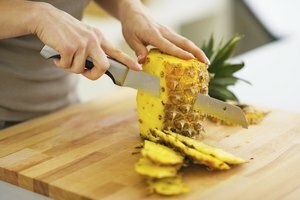 Place the pineapple on its side on the cutting board. Cut off the top and bottom so that each end is flat. Stand the pineapple on either end. Cut down the side to remove the rind. Your cuts should go from top to bottom and remove a strip of rind each time. Do not worry if small bits of rind remain. Cut the pineapple, still standing on end, down the middle. Cut these pieces lengthwise again, so that you have four long pieces of pineapple. Line these pieces up side by side and slice into 1/4-inch pieces. You do not need to remove the core. Place one or two pieces at a time into your juicer. If the pieces are still too big, cut them to fit. Turn the juicer on to create fresh pineapple juice. Some minor bruising is acceptable when choosing a pineapple to juice. 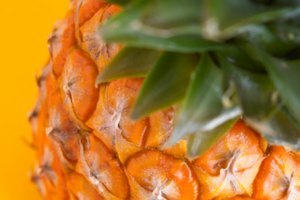 If you use an organic pineapple and you have a good quality juicer, you do not need to remove the rind. 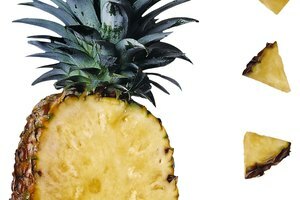 Simply wash the pineapple and remove the top and bottom and cut as indicated in the steps. Ann Craney started writing professionally in 2010, with articles appearing online at various websites. She specializes in food-related topics as she has formal patisserie training. Craney earned a Bachelor of Arts in English literature from the University of British Columbia.